We’re are now offering Bentley Bentayga Rentals in Miami. One of the fastest SUV’s on the market, the Bentayga offers an exquisite combination of comfort and speed in a luxury SUV. The iconic, eye-catching grill is the first thing you see when you first take a glimpse of this SUV. This new Bentley is the perfect luxury car rental for any occasion. Sophisticated styling and the most technologically advanced V12 engine in the world it’s the perfect car to rent if you’re traveling Miami in a group. The new V12 engine was designed from the ground up. It delivers the perfect combination of torque, power, and efficiency of an SUV. It seamlessly switches between direct-injection and port-injection in order to deliver the most efficient performance. The engine is equipped with two turbochargers that have been optimized for performance. One of the fastest SUV’s on the market it races from 0-60 in just 3.5 seconds with a top speed of 187 mph. Miami Beach traffic won’t be an issue because of the Stop-Start technology that is available for the first time in any Miami Bentley rental. The exterior of the Bentley Bentayga showcases Bentley’s timeless design taking luxury to all new landscapes. 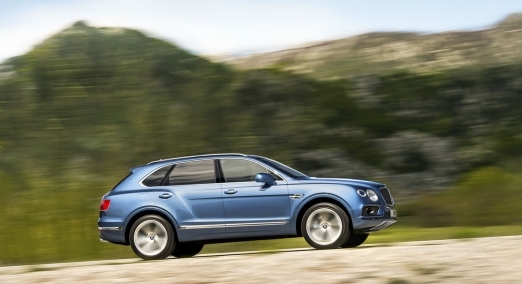 A first look at the four familiar round headlights of this luxury SUV you can tell it’s unmistakably Bentley. The aluminum body showcases Bentley’s signature sharp lines and seamless surfaces. It is equipped with fully adaptive LED lamps that fit flush with the body allowing you to navigate through Miami’s nightlife with no problem. Rent Bentley Bentayga in Miami and experience a high-class interior with all the bells and whistles. The interior and practically everything inside uses only the finest materials. The Bentayga’s interior is elegant and refined, finished with the finest materials. The rare craftsmanship and attention to detail speak sophistication. Your passengers will be relaxed and calm as soon as they step into this luxury SUV. The Bentley Bentaya cost around $1995 per day but we can give you better rates for long-term rentals. Rent a Bentley in Miami with Diamond Exotic rentals today! Bentayga’s many lists of features are guaranteed to make your next occasion special. If you’re traveling with the family or picking up your next potential client this is the most versatile Bentley rental ever. South Beach is one of the most popular destinations in the world. Make your time here an unforgettable memory that will last forever. We offer free delivery to Miami International Airport or your hotel in Miami Beach.